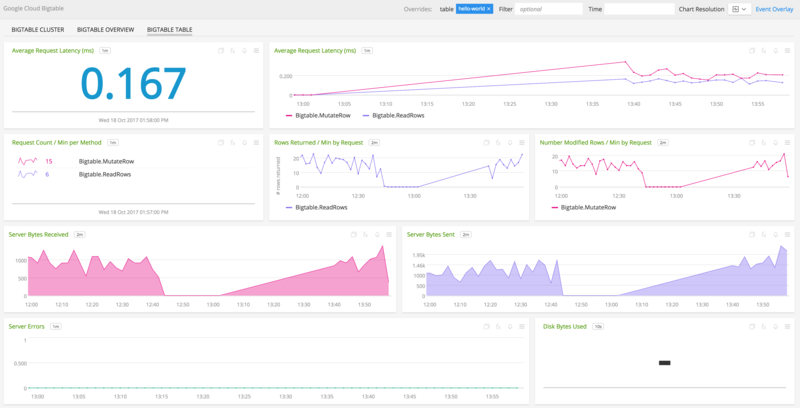 Use SignalFx to monitor Google Cloud Bigtable via Google Cloud Platform. Bigtable Overview: Overview of project level metrics for Google Cloud Bigtable. 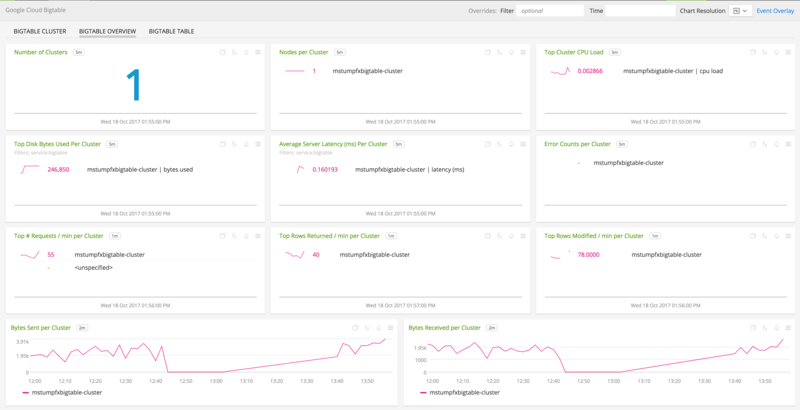 Bigtable Cluster: Overview of a cluster metrics for Google Cloud Bigtable. 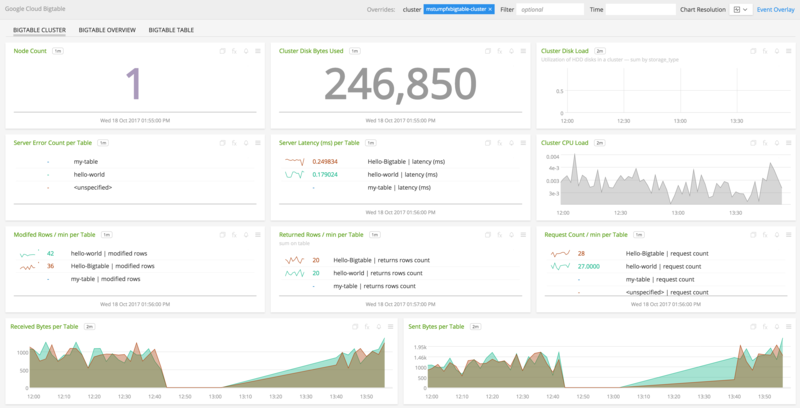 Bigtable Table: A table level look at metrics for Google Cloud Bigtable. To access this integration, connect to Google Cloud Platform. Node Count - Number of nodes in the cluster. Cluster Disk Bytes Used - Amount of compressed data stored in a cluster. Cluster Disk Load - Utilization of HDD disks in a cluster. Server Error Count per Table - Number of server requests for a table that failed with an error aggregated by Table. Server Latency(ms) per Table - Distribution of server request latencies aggregated by Table. Cluster CPU Load - CPU load of the cluster. Modified Rows / min per Table - Rate at which rows are modified aggregated by table. Returned Rows / min per Table - Rate at which rows are returned by server requests aggregated by table. Requests / min per Table - Rate at which server makes requests aggregated by table. Received Bytes per Table - Rate of uncompressed bytes of response data received by servers. Sent Bytes per Table - Rate of uncompressed bytes of response data sent by servers. Number of Clusters - Number of clusters. Nodes per Cluster - Number of nodes aggregated by cluster. Top Cluster CPU Load - Top 5 clusters based on CPU load. Top Disk Bytes Used Per Cluster - Top 5 clusters based on disk bytes used. Average Server Latency(ms) Per Cluster - Average server latency aggregated by cluster. Error Counts per Cluster - Error counts aggregated by cluster. Top Number of Requests / min per Cluster - Clusters with top 5 rate of requests. Top Number of Rows Returned / min per Cluster - Clusters with top 5 rate of rows returned by server requests. Top Number of Rows Modified / min per Cluster - Clusters with top 5 rate of rows modified by server requests. Bytes Received per Cluster - Rate of uncompressed bytes of response data received by servers aggregated by cluster. Bytes Sent per Table - Rate of uncompressed bytes of response data sent by servers aggregated by cluster. Average Request Latency (ms) - Average latency of server requests for a table. Average Request Latency (ms) Trend - Trend of average latency of server requests for a table. Requests / min per Method - Rate of server requests aggregated by method for the table. Rows Returned / min by Resquest - Rate at which rows are returned by server requests aggregated by request. Modified Rows / min by Resquest - Rate at which rows are modified by server requests aggregated by request. Server Bytes Received - Rate of uncompressed bytes of response data received by servers. Server Bytes Sent - Rate of uncompressed bytes of response data sent by servers. Server Errors - Number of server requests for the table that failed with an error. CPU load of a cluster. CPU load of the busiest node in a cluster. Utilization of HDD disks in a cluster. Number of nodes in a cluster. Amount of compressed data stored in a cluster. Number of server requests for a table that failed with an error. Distribution of server request latencies for a table. Number of rows modified by server requests for a table. Number of uncompressed bytes of request data received by servers for a table. Number of server requests for a table. Number of rows returned by server requests for a table. Number of uncompressed bytes of response data sent by servers for a table.